On a wet Sunday evening the Barbican crowd were taken on journey by Bill Frisell from the sixties, post-Blitz Brutalist architecture of London to the same evocative period across the Atlantic. Steeped in sun-kissed hope, Guitar in the Space Age! was a nostalgic return to the country, blues and surf music of Frisell's formative years, seen through the prism of the civil rights movement and the seemingly infinite possibilities of scientific progress at that time. Before looking to the stars, supporting act Sam Amidon located the concert in its all-American heartland with a string of beautiful and sincere folk songs and ballads. His endearing patter and evocative traditional singing style belied some of the complex texture and variation supplied by touring partner Chris Vatalaro on bass, drums, laptops and keys. 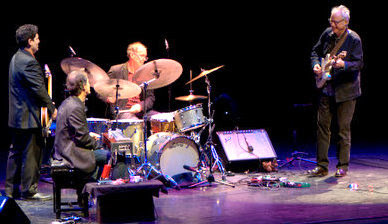 While Amidon was unexpectedly joined on stage for the entirety by Frisell himself, accompanying with his telecaster, his role was very much complementary to Amidon and Vatalaro's routine, featuring pieces from new release Lily-O. Amidon's folk provided a context for the music that Frisell revisited in his inimitable style when he returned to the stage with his group. With Frisell now clearly in the driving seat the trajectories of the songs took his more circuitous and patient route, with a restrained Frisell met by the relaxed slide of Greg Leisz's pedal steel rising to an intense finale: a brief hint of some of his Naked City work slipping through before falling back into a comfortable blues. Throughout the evening Frisell was exceedingly comfortable, barely halting to address the audience but instead rolling song into song, playfully revealing a previously concealed theme before embarking on a piece in earnest. With Kenny Wollesen ably adding spark to proceedings, the core dynamics on-stage were controlled by the clear understanding between Frisell and bassist Tony Scheer. Tired of Waiting For You in particular was brought to life by the nuanced styles traversed as Frisell and Scheer communicated across the stage, building a very American sound from a very British song. Whether the audience were familiar with the originals or not, Frisell and friends presented a very accessible set touching on distinctive pop culture surf theme Rumble, and Tornados classic Telstar closing the scheduled performance. As he remounted the stage Frisell, as effective with his sparse use of words as he is with his sparse playing style, gratefully announced “I love every- I love most people”. Less cautious in music, the beautiful re-workings of the music of his childhood years selected from Guitar in the Space Age! certainly came from the heart.